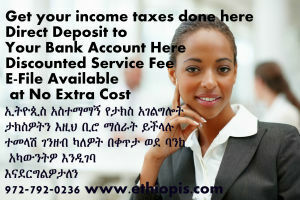 Ethiopis Travel offers income tax services in our office in addition to the many other services we provide. We will do your taxes accurately and in a timely manner so that you won’t have any IRS issues later on. Bring your W-2s to our office or any other tax document and you will get a quick and reliable tax services. 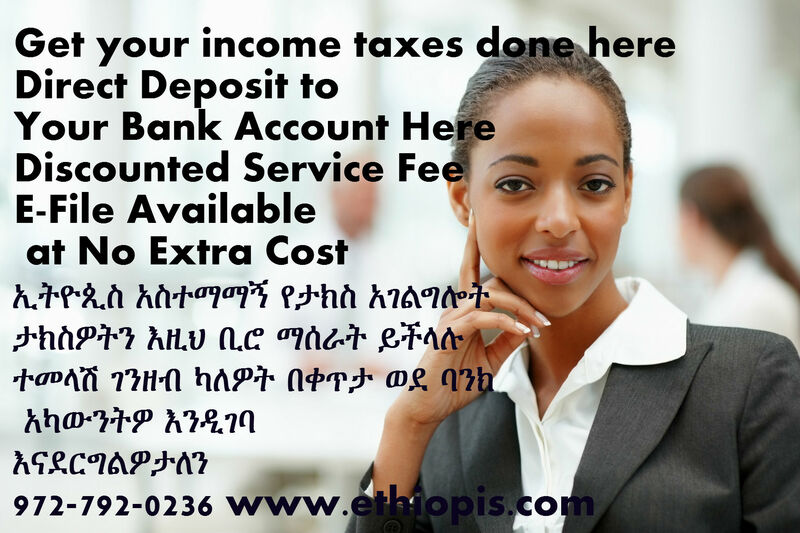 We do free e-filing and direct bank deposit to your account if you have a tax refund coming. We are an IRS recognized e-file provider. We do not come between your refund and the IRS. We simply do your taxes, and make sure you get all of whatever refund is legally due to you. We only charge our service fee up front. If interested, you can print our simple tax form by clicking here and then print it, fill out the simple questions on it, and bring it to our office along with your W2s and other relevant tax documents so that we can professionally prepare your tax return. *We also prepare 1099s for self employed or contract empoyees and efile it for your for a low fee.